Spaghetti is a staple in my house. It’s such a quick and easy meal and I know that my family will eat it…even my picky eaters love spaghetti. 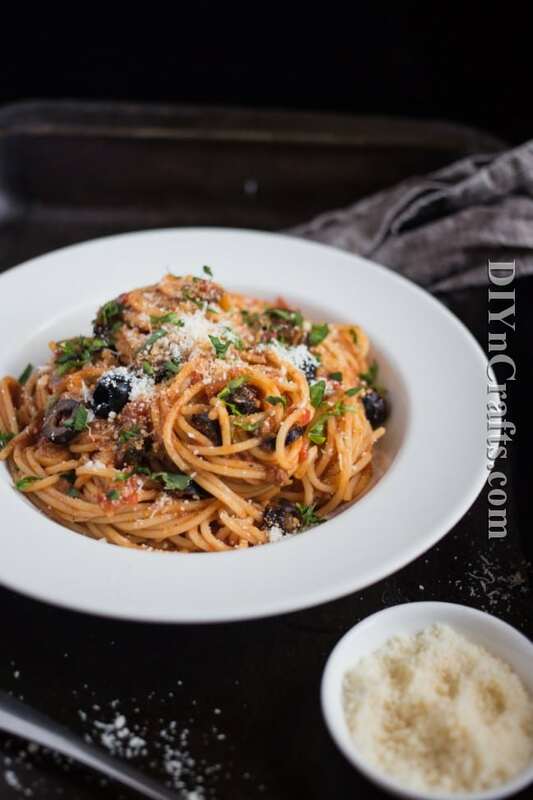 So, when I found this spaghetti puttanesca recipe, I thought that maybe just maybe I could get them to try something other than simple spaghetti and meat sauce. I normally just use a canned sauce, because that’s what they will eat. I am happy to report that they also love this puttanesca recipe! This is so easy to make. 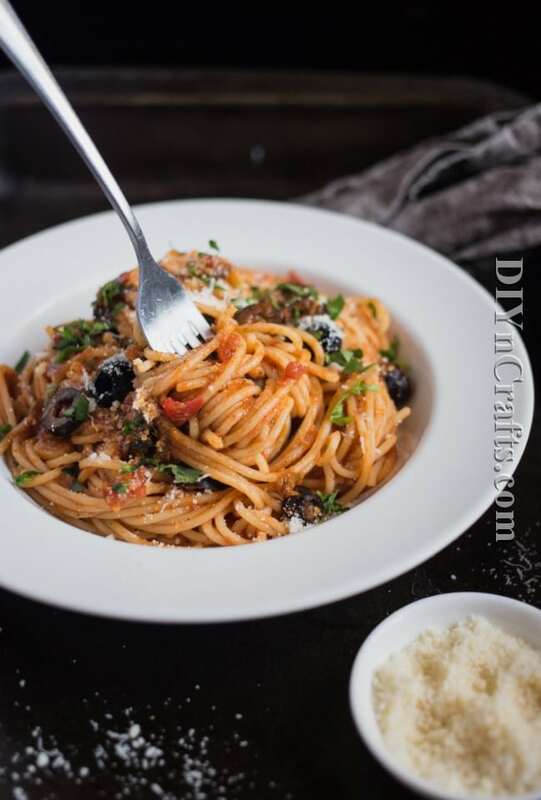 It only takes about 10 minutes to get ready and then another 10 minutes to cook, so it’s just as easy as my traditional spaghetti but it has so much more flavor than canned sauce! 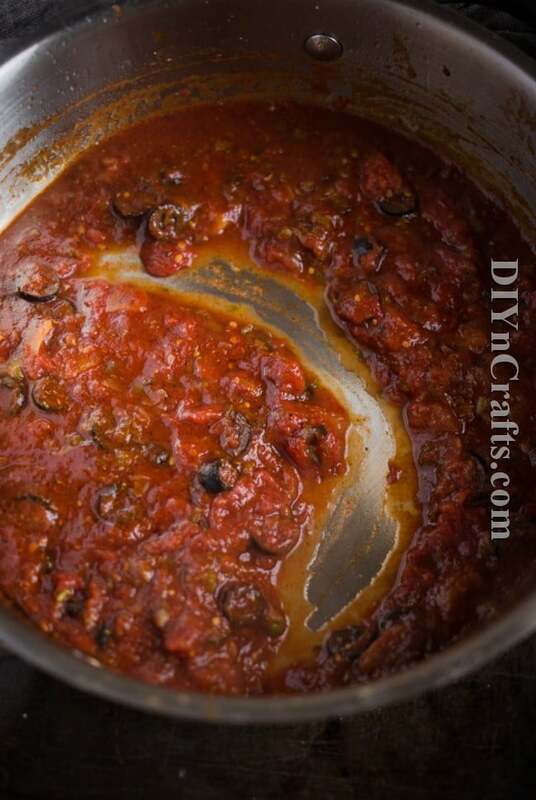 I love cooking homemade meals but had never found a spaghetti sauce recipe that was as quick and easy as opening a jar or a can. Well, now I have and I love it! This one has capers, black olives and anchovies…yes, my family at anchovies! I couldn’t believe it either, but they did and yours will, too. And to treat them for trying something new, be sure to bake up this yummy blueberry pie for dessert! Spaghetti will always be one of my family’s favorite meals and I am so happy that I have a recipe that is a bit different from the traditional one that I have used for years. I honestly wasn’t sure that they would like this one and I am so glad that they did. Of course, I didn’t think that my picky eaters would try this amazing salmon wellington either. Sometimes your family can really surprise you. 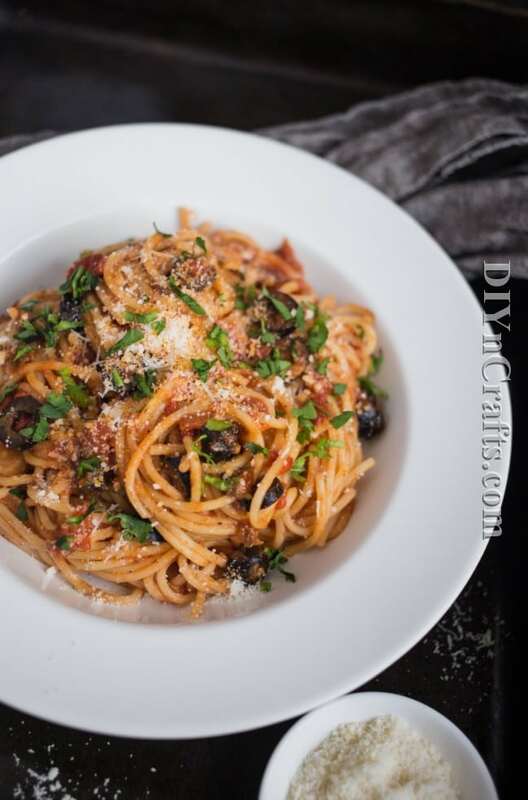 Surprise them back by making this delicious spaghetti puttanesca for dinner tonight. They will definitely thank you by licking their plates clean! 1. Heat olive oil over medium heat. Add sliced garlic and anchovies and cook until aromatic (about 1 minute). Stir in capers and olives. 2. Pour in tomato puree, tomato juice and tomato paste. Cook for 10 minutes. 3. Meanwhile, cook spaghetti al-dente. 4. 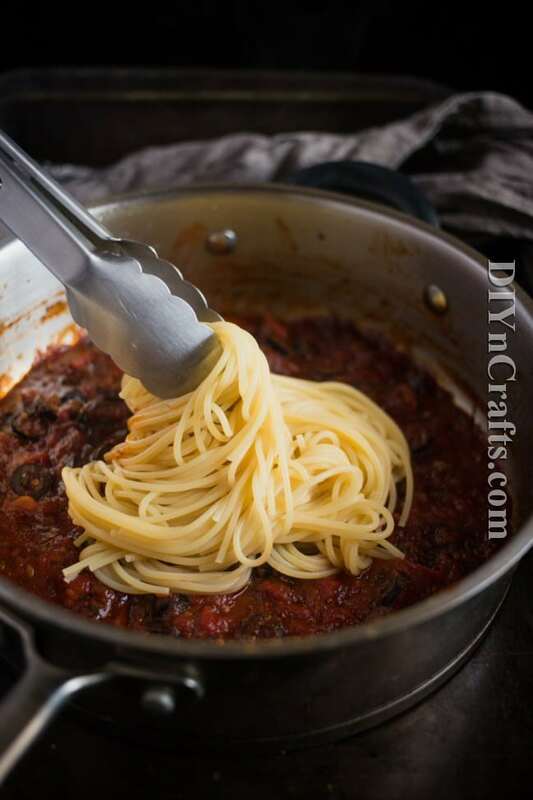 Add spaghetti to the sauce with about ½ cup of pasta cooking water. Stir to combine and serve topped with parmesan and parsley. Spaghetti will always be one of my family’s favorite meals and I am so happy that I have a recipe that is a bit different from the traditional one that I have used for years. Heat olive oil over medium heat. Add sliced garlic and anchovies and cook until aromatic (about 1 minute). 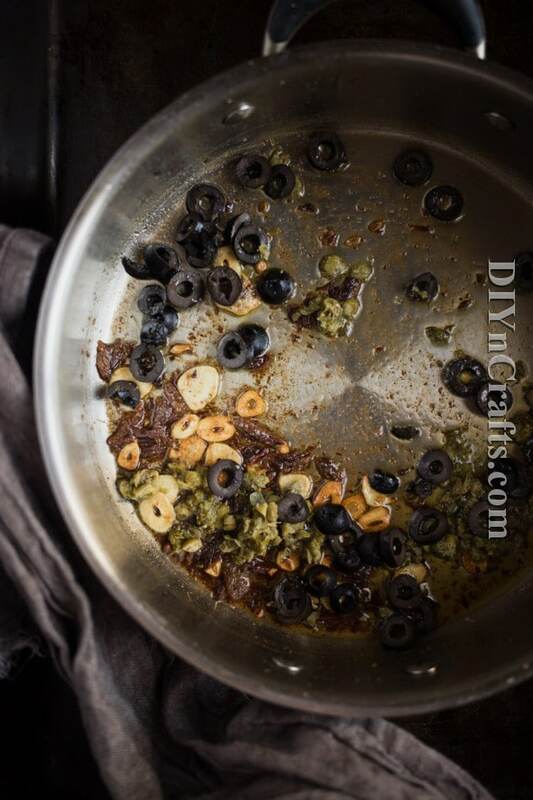 Stir in capers and olives. Pour in tomato puree, tomato juice and tomato paste. Cook for 10 minutes. 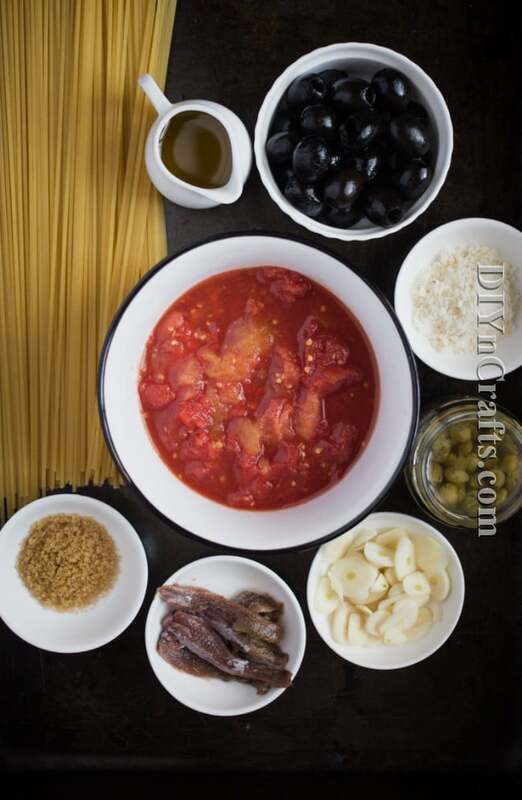 Add spaghetti to the sauce with about ½ cup of pasta cooking water. Stir to combine and serve topped with parmesan and parsley. Is your ingredient list missing the garlic? I couldn’t find it. It was mentioned in the instructions, and I certainly want to use it.